View the tournament site map to learn more. 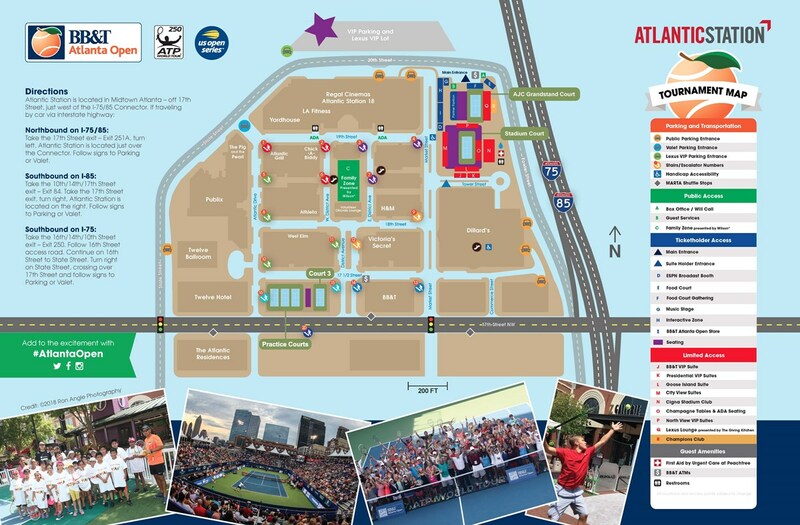 To purchase parking passes prior to the event, please visit www.bbtatlantaopen.com. For questions or concerns, email tickets@bbtatlantaopen.com or call (404) 941-9202. To view a parking map, click here. Lexus owners receive complimentary parking in our 20th Street parking lot at the north end of Atlantic Station. Also, Lexus owners receive a special reduced price of $5 to use valet parking. You must have a valid ticket. See available locations. Atlantic Station provides regular complimentary shuttles to and from the Arts Center MARTA Station. Atlantic Station increases the number of shuttles during the tournament. Take I-75/I-85 (the Downtown Connector) to Exit 250, Tenth Street/Fourteenth Street/Georgia Tech. Stay Straight on Williams Street, and then turn left on 14th Street at the light. Turn right on State Street across 17th Street. Turn right into the parking deck and take a ticket. Follow Southbound until GA 400 ends and merges onto I-85 and take Exit 84, Seventeenth St/Fourteenth St/Tenth St. Keep right. Take a right off the exit onto 17th Street. Continue on 17th and take a right on State Street just past the Twelve Hotel. Follow State Street, which becomes 20th Street, around the back of the Regal Cinema 16. Take quick right into the parking deck and take a ticket. Follow Southbound and take Exit 84, Seventeenth St/Fourteenth St/Tenth St. Keep right. Take a right off the exit onto 17th Street. Continue on 17th and take a right on State Street just past the Twelve Hotel. Follow State Street, which becomes 20th Street, around the back of the Regal Cinema 16.Take quick right into the parking deck and take a ticket. Follow Southbound and take Exit 250 Sixteenth St/Fourteenth St /Tenth St. Follow access road under overpass and take 16th Street. Follow 16th Street until the light. Take a right on State Street at the light. Cross over 17th Street. Follow State Street, which becomes 20th Street, around the back of the Regal Cinema 16. Take a quick right into the parking deck and take a ticket.